When Did Your State Adopt Its Sales Tax? 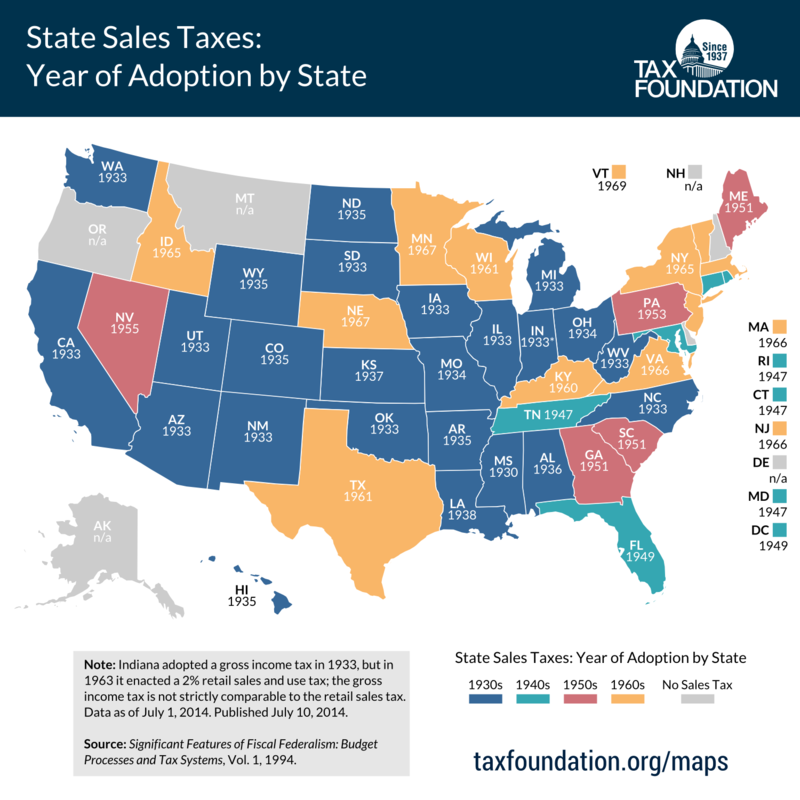 This week’s map takes a look at when each state adopted its sales tax. The trend began with Mississippi in 1930 and continued rapidly throughout the Great Depression – a crisis which left states strapped for cash amidst declining property and income tax collections. By the end of the 1930s, 22 states had implemented a sales tax. Six states and the District of Columbia joined on in the 1940s, and five did so in the 1950s. The next decade brought twelve more states on board, and the last state to adopt a sales tax was Vermont in 1969 – leaving only five states (Alaska, Delaware, Montana, New Hampshire, and Oregon) without a statewide sales tax. Generally, states imposed sales taxes as a supplemental revenue source to existing personal or corporate income taxes. However, eleven states (mostly in the Rust Belt and the Northeast) adopted a sales tax before their individual income tax, and eight states did so before their corporate income tax. Five states (Rhode Island, Indiana, Arizona, New Mexico, and Nebraska) implemented their sales tax in conjunction with their corporate tax; the latter four adopted individual income taxes the same year as well. Last year, Rhode Island considered a proposal to eliminate its sales tax, which would have made them the first state to repeal the tax and would have boosted the Ocean State from 46th to 31st in our State Business Tax Climate Index. Sales taxes currently account for about one-third of total state tax revenue, continue to be one of the most widely accepted forms of taxation, and are generally less harmful to economic growth than income taxes. Read more about current state and local sales taxes here. Note: The source of this data, Significant Features of Fiscal Federalism: Budget Processes and Tax Systems (1994), lists 1933 as the date in which Indiana adopted its sales tax. This is instead the date in which a "gross income tax" was enacted in Indiana, which is not comparable to a retail sales tax. Indiana's actual retail sales tax (comparable with other state retail sales taxes) was enacted in 1963 (see here for more information).